At the invitation of the Federal Ministry of Labour and Social Affairs, the Ed-ICT network will be presented at this year's Inclusion Days. 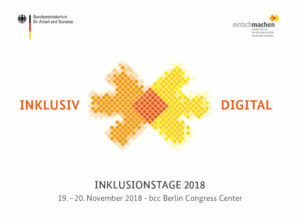 This year's inclusion days will take place from 19 to 20 November 2018 in Berlin, Germany. This time they will be all about digitisation, and focus on innovation and participation in digital applications. Together, good examples of digital innovations will be presented and, in addition to impulses from futurology and education, the participants will talk about wishes, challenges and expectations for the digitisation of people with disabilities in thematic rounds and workshops. More than 700 representatives of social, welfare and disabled associations, science, companies, the federal states, federal ministries and, above all, people with disabilities themselves will take part in the event. The workshop "Digitisation and Inclusive Education" on 20th November will address the question of how digitisation can open up opportunities for people with disabilities. This workshop will not only focus on discussion. The workshops serve above all as a great brainstorming session to collect suggestions from the participants as well as to jointly develop ideas. In this way, digital strategies can be formulated from the findings.